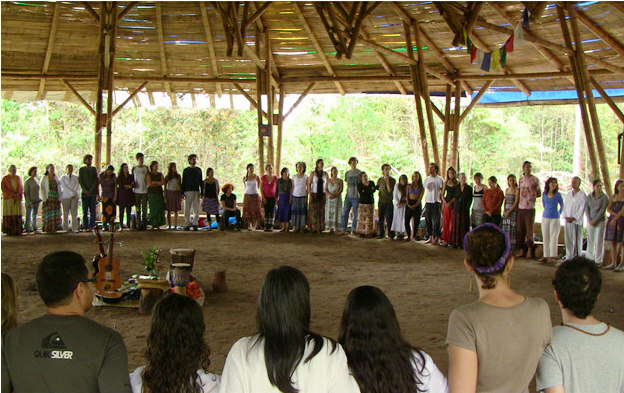 As a Friend of GEN, you become a sustaining contributor to the work of the Global Ecovillage Network. Together we can continue to implement sustainable solutions and help catalyze the power of community for a regenerative future. By becoming a Friend of GEN you will receive exclusive benefits to bring you closer to GEN’s work on the ground and connect with communities worldwide. Friends of GEN sustain the work of the Global Ecovillage Network through creating a grassroots community of supporters for ecovillage solutions and collaboration. Learn about the levels of giving below and find the one that is right for you. Become a Friend of GEN! Explore ecovillage projects all over the world in this 200+ page, full color book. It includes interviews with founders and long-standing members, plus personal stories, thoughts, experiences, adventures, failures, learnings, and successes from the growing ecovillage movement. As a Sustaining Friend of GEN, you will be paired as a friend of an ecovillage in your region, receiving special notices and videos two or three times a year about that ecovillage. This is your invitation to become more involved in the ecovillage movement, hands on and face to face! The Global Ecovillage Network offers our Regenerative Friend of GEN donors a generous discount on one-on-one coaching sessions with members of our consultancy team. Receive personalised suggestions, networking opportunities and inspiration as you step into the ecovillage movement! I would prefer to make a single donation for an amount of my choice, without associated Friends of GEN benefits.